Even if there are nearly the whole year round whale shark in the Moalboal area, it seems that most sightings occur on the dive spot Tuble Reef. To see a whale shark is definitely one of the most amazing experiences a diver can have, but unfortunately very seldom and always depending on a bit of good luck. 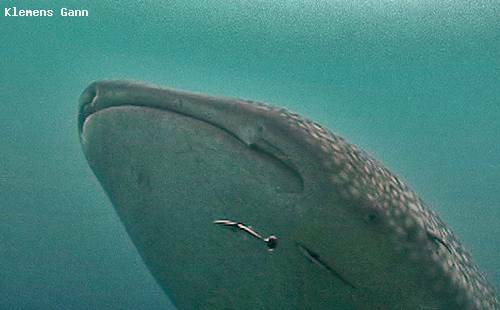 Whale sharks in different sizes have been observed through the years and usually they are encountered in shallow depths. If you are not lucky on your dive you still can enjoy a reef wall covered in different corals and also turtles are seen here frequently. As Turtles are very common here in Moalboal, especially at a dive called Tuble, they will be around you everywhere. Some are shy and move away, some will just get in a perfect pose get caught on your camera. Others than Turtles you can see Octopus, Frogfish, Nudibranches and all other Macro stuff you can imagine. Even sometimes small lobsters want to be caught on your Camera. Go ahead and get the best shot.